When you really want to make your lawn stand out, one of the things you might want to do is top dressing. 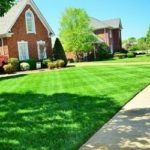 This is a procedure that many people take for granted, but which actually has numerous benefits for any lawn. In fact, if you have been spending a lot of money on trying to come up with the perfect lawn and are not getting the best results, you might be surprised to find that simply having it top dressed will solve most of the problems you are experiencing. One of the commonest problems you are likely to face when cultivating a high quality lawn is how to get rid of uneven terrain. Even when the grass becomes lush, the presence of too many dips in it will reduce its appeal. Top dressing is one of the most effective ways of solving this problem. With time, you will be able to even out the surface, making it look level. Another common problem you might have with your lawn is finding that is has numerous bare spots. This could be due to many issues including having many people walk on the same spot over and over. Top dressing increases the nutrients in that part of the lawn, allowing the grass to grow faster and to cover up the patch. Poor drainage in a lawn could lead to many problems including poor health for the grass. It could also create boggy areas within the lawn. You can use top dressing as one of the remedies for this. Using high quality loam soil or other organic matter to top dress the soil will improve drainage. If the drainage is caused by poor layout of the land, you can still use top dressing to address the issue as well. In summary, there are many benefits of using top dressing in a lawn. If you are interested in improving the quality of the soil or simply sorting out any of the issues above, you should seriously consider using this technique. If you don’t have the time to do it, you can always consult professionals such as a landscaping artist to do it for you instead. Top dressing will have benefits that last far into the future, making it extremely valuable.